When it rains, it pours. A little while ago I blogged about how there appears to be a growing resistance against bike helmet laws around the world. Then I got word from my network of a couple more developments. 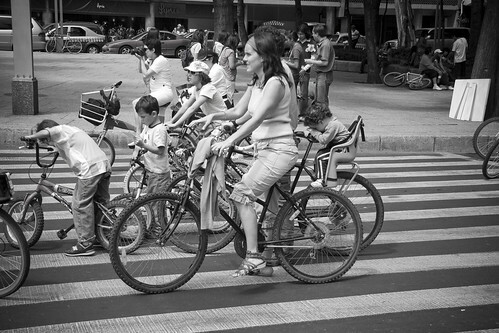 Mexico City repealed their bike helmet law back in February 2010. Let's face it, it wasn't much of a law since there was little enforcement and it was, essentially, unenforceable. Back in 2008 there was a bicycle count including over 26,000 cyclists and 93% of them didn't feel the need to wear a helmet. 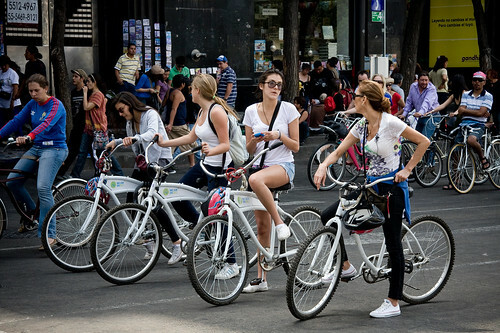 The main reason for the push to repeal the helmet law was the upcoming implementation of the city's bike share system, Ecobici. The Institute for Transportation and Development Policy [ITDP] were instrumental in getting the law repealed but there was also support from within the city government. Back in December I blogged about how the helmet law in Israel was up for repeal, as well. From what I've heard the lobbying was successful and adults are no longer forced to wear helmets. Any more info on this is appreciated. Basically, the helmet law in both places stood in the way of bike sharing programmes that would serve to encourage more people to cycle. Programmes which have been successful in achieving this goal in Paris and Lyon and 24 other French cities, as well as Barcelona and Seville and other Catalonian/Spanish cities and many places around the world. The Australian Helmet Hurdle regarding bike share programmes is well-known. Nevertheless, there are still crazy ideas floating around in that country like making cheap helmets available at corner shops so that if you spontaneously want to grab a public bike for a short trip somewhere, you'll have to first piss all over that spontaneity and go into a shop to buy a cheap helmet. In short... Got a helmet law? Don't bother with bike share programmes until you repeal it.